Although we may like to believe that our appliances will last us a lifetime, this is simply never the case as appliances are not designed to last forever, even your refrigerator. Many individuals may consider their refrigerators to be irreplaceable, but sooner or later, they may present you with a problem. You may hire an appliance repair technician to fix the refrigerator repair issue, but there may come a time when you will need to completely replace your fridge. The question that many people may be asking when it comes time to get a new fridge is: How do I get rid of a fridge? Once you have decided that you need to acquire a new working refrigerator, you will need to first consider the disposal options for your old fridge carefully. There are several factors that you will need to weigh before you are able to purchase a new fridge, but how will you be disposing of the old fridge? Fortunately, you have a few options to choose from when it comes to getting rid of your old fridge properly and safely. After you have made the decision to dispose of your old fridge, the first thing you will want to do is to remove the door of the fridge. If needed, you may request the assistance of an appliance repair professional to complete this step (someone who has refrigerator repair experience). Removing the door of the fridge will prevent children from being able to enter the fridge and risk being suffocated. Once the door is removed, it is acceptable for the existing shelves to remain inside. One of the most common ways that people dispose of their old fridge is to ask the retailer to take it away. Make an arrangement with your fridge retailer and ask if they can take the old fridge away once they deliver your new fridge. In many cases, your old refrigerator will be recycled or refurbished in order to sell it as a second-hand refrigerator. Although this arrangement is convenient, there may be a fee involved for disposing of a fridge. 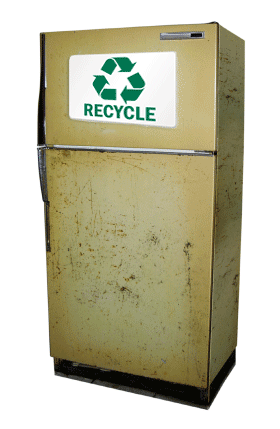 Another way in which you may dispose of your old refrigerator is to find a local recycling program in your area. You may also get in touch with a local utility company and ask if they offer an appliance recycling program. In fact, there may even be appliance recycling incentives available. These are usually operated through Jaco Environment, Inc. or ARCA (Appliance Recycling Centers of America). If you are able to make arrangements with the SEEARP (State Energy Efficiency Appliance Rebate Program), you may even be able to receive a rebate for recycling your old refrigerator. In addition to asking your retailer or local recycling program, you can also choose to contact a local waste management service or the local council’s environment department. They may be able to provide you with some information in regards to how to properly dispose of your old refrigerator. You may make arrangements for a council to pick up the old fridge, but some councils may charge a fee for their services. Be sure to ask beforehand as these rates will vary.